We know now that the next test phase for Final Fantasy XIV will not be until June. This is good insofar as the next test will contain a lot more stuff and bad insofar as I want to play. Those of you living vicariously through impressions articles such as this one probably have less of a struggle with this scenario. And there is still a chunk of the first two phases to be discussed, obviously. 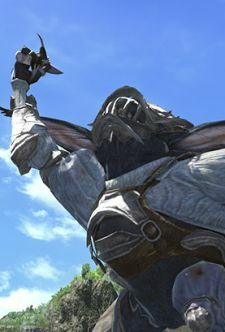 If combat is the usual “how” of MMOs, quests are the usual “what.” Final Fantasy XIV started out with a handful of quests and gained several more during Naoki Yoshida’s tenure, but quests still weren’t the main leveling content in version 1.0. That was a function reserved for guildleves, which have taken on a new role in the beta phases just as quests are enjoying an expanded importance. But it’s not as simple as that change might imply. Not all quests are created equal in FFXIV. This was true in the first version, as well. You had your main scenario quests, your grand company quests, your guild quests, and so forth. This has not changed in the beta, which still features main scenario quests, guild quests, and regular side quests. What has changed is the frequency and purpose of these quests. In the launch version of FFXIV, there were three quests for each guild. Not three main quests — three quests, period. Each one covered a small amount of backstory for the guild, gave you a tiny bit of flavor, and then left you high and dry without further content. You couldn’t even join the guild until level 20 or so, by which point it was an amazing coincidence that you were up to the standards that a guild had set for membership. By contrast, in the beta phases, you get your first guild quest at level 1. Literally one of the first quests you are given sends you to the headquarters for your guild to pick up the associated quests and hunting log entries. And the story unfolds from there in five-level intervals, with a new ability awarded for the level 15 quest and plenty of story development in each guild. The main scenario quests are similar insofar as they are clearly handed to you with reliable frequency. You won’t always be on one, but you’re always given a sign of when you can pick up the next one, and there are no longer long stretches when you’re without any direction. Sidequests are more numerous and spaced to ensure that if you want to level your first class almost entirely through quests, you have more than enough options. So what are the actual quest mechanics like? For the most part, they’re like literally any other quests you have ever seen. I’m not distraught about this fact, but there’s nothing to gush over when it comes to the raw mechanics of questing in FFXIV because it’s stuff that I’ve seen before. The quest dialogue is well-written and gives a good sense of the word; it’s helped along by the fact that you page through dialogue boxes instead of just having the text vomited at you in a single blurb, but… you know the deal. Go out and kill X number of Y and so forth. The main scenario and class quests are frequently more inspired. There’s a Lancer quest in which you face a huge horde of wolves with a time limit; you can’t possibly kill them all by rushing in, so you have to pick off stragglers, thin the group, avoid links, and make strategic approaches to your target. But the core of the quest mechanics are going to be familiar to almost anyone who has played an MMO in the past five years. They work, and for my money, the actual meat of the game is entertaining enough that I’m not bothered by the unoriginality of the mechanics. But the quests do work in a very pedestrian fashion, without a doubt. They scratched an itch, and I enjoyed them, and I’m not going to claim that they tap into some deep vein of novel design. It was the setting and the mechanics around the quests that impressed me. Pick up leves appropriate to your level. Fight through those leves, traveling back to the aetheryte each time you clear one. In the beta phases, the flow was slightly different. Go to a level-appropriate levemete near the area of the leves. Travel to the area where those leves take place. Clear the leves and then return to the levemete. The shift is subtle but significant. Before, you would have to travel back and forth a lot to get even a quartet of leves done; here, you have a new set every five levels, and the travel time is not significant in any direction. You go to the relevant area, clear something, and then zap back to the same person who gave you the leve in the first place. Again, the mechanics aren’t terribly different, so veterans of 1.0 will be very accustomed to the core concepts. (The betas did have several leves introducing more advanced concepts early on, rather than straight pursuit or engage leves until your 30s.) The difference is in the details of execution and the sidelining of leves as a whole. You can take part in several leves instead of quests, you can use them for classes after your first ones, and you can use them as sidelines instead of hunting log entries and the like. While neither guildleves nor quests have revolutionary mechanics, the layout of the content is refreshing because it’s not a straight line. There are loose pointers, but if you decide to strike off in a different direction, the game officially does not care. Want to just fill out your hunting log? Go nuts, man; you’ll know when there’s another main quest to do. It’s refreshing. The seasonings of a quest-driven game are there, but it lacks the pressure.